Winter is in full swing this January, with snow, ice and bitter temperatures. For many of us who own a home, it’s a season that calls for additional tasks such as salting, shoveling and winterizing. And, if you prefer not to do these things yourself, you may have to rely on family members to help or pay out-of-pocket for a professional. The winter months can also be a time for staying inside and having to cancel plans due to inclement weather. Snow can keep us at home, isolated from family and friends, and unable to do our regular routines, such as grocery shopping, seeing friends, going out to a restaurant, or visiting the doctor, pharmacy, bank or post office. 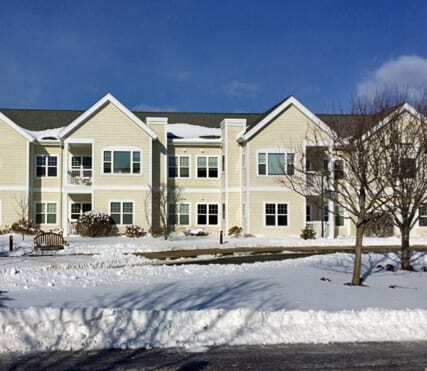 However, for the residents of Continuing Care Retirement Communities, like The Knolls, winter weather is never a worry! At this Westchester retirement community, winter chores and services are done by the maintenance team, leaving residents with plenty of time for social activities, regardless of the weather outside. Even in the most frigid temperatures, residents have access to on-site services like the campus post office, health center and convenience store. When snowflakes begin to fall over The Knolls, a maintenance crew quickly jumps into action, sanding and salting the walkways and parking lots. As snow accumulates, they work quickly to plow parking lots, and shovel walkways and outdoor areas. As a resident of The Knolls, you won’t have to take care of any of these responsibilities yourself, leaving more time for you to spend doing the things you want to do. If you wish to run errands around town, you’ll be able to easily get out with clear lots and scheduled transportation. The maintenance crew also takes care of winterizing the building’s interior and exterior and campus grounds, so residents need not be concerned about doing any such outdoor chores. It’s all about worry-free living and spending time doing whatever is most enjoyable to each resident. There is always plenty to do at The Knolls! A typical week includes opportunities for exercise, recreation, relaxation, socialization and intellectual discourse. Exercise opportunities include classes and aquatic programs with the fitness coordinator, as well as yoga, tai chi and much more. Or, you can enjoy snowy days watching films shown in Victorian Hall in the evenings and afternoons. Genres include current, classic, foreign films and even documentaries. Friday nights feature play readings and the book club meets monthly to discuss the latest read. Board games are played every Sunday afternoon, with refreshments served. There are many avid poker, mahjong, and bridge players among the residents who also enjoy taking time to teach these games to beginners. In addition to these activities, The Knolls provides residents with live entertainment which cater to all tastes as well as guest speakers who discuss a range of engaging topics. However, the winter weather doesn’t mean you’re stuck inside! There are plenty of opportunities for enjoyable trips to museums, restaurants, libraries and stores; and our maintenance team and scheduled transportation service are at the ready to help you get to where you need to go. Regardless of the weather, residents can stay active and engaged all winter long. For more information about the benefits of living at The Knolls, give us a call today at 914-468-4728, or visit us online to request your personal appointment and tour.